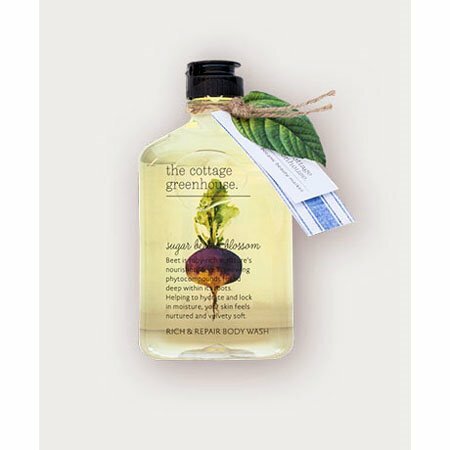 Sugar Beet and Blossom Rich & Repair Body Wash by The Cottage Greenhouse | P.C. Fallon Co.
Sugar Beet & Blossom Rich & Repair Body Wash is a wonderfully fragrant potion that will cleanse, refresh and moisturize in one fell swoop, leaving your skin incredibly soft and sublimely scented. Once you try it, you will make the switch away from ordinary soap happily forever after! Ideal for use when shaving as well as cleansing. Contains natural moisturizers Cocoa Butter and Coconut Oil along with beet root extract, rich in cell renewing phytocompounds, to lock in soothing moisture to your skin. The Cottage Greenhouse products are made in USA and contain no parabens. 340 ml / 11.5 fl oz.